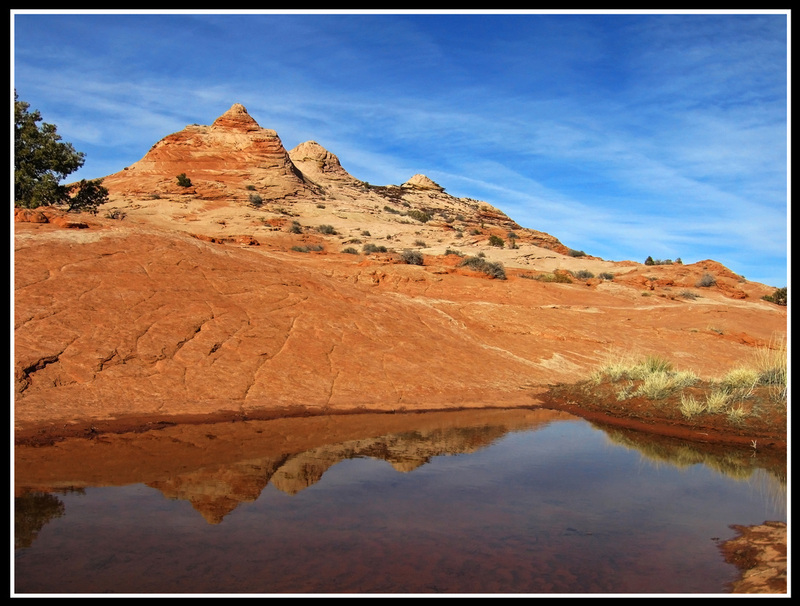 Josh and I did this hike as part of out spring break trip in 2010 when we spent a full 9 days in the Utah desert. A very cold and snowy winter for southern Utah forced us out of the San Rafael Swell and Robbers Roost areas so we headed further south to the Escalante region where I had heard of a massive arch I thought would be cool to visit (Phipps Arch). 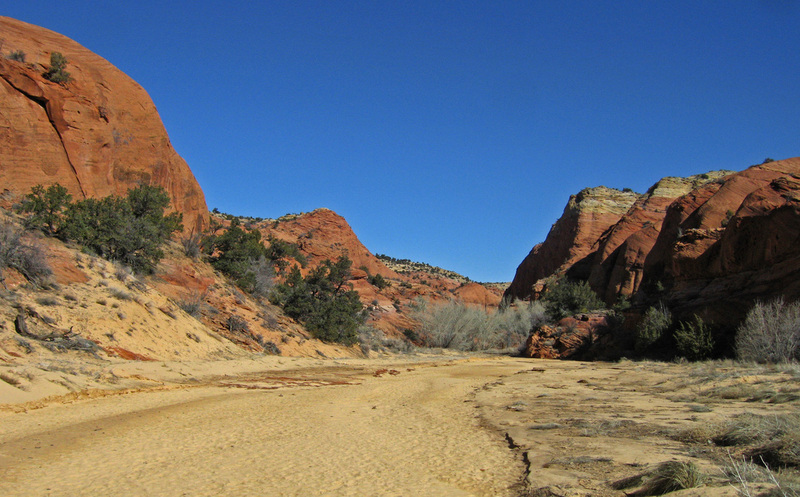 We pulled off Highway 12 on the Spencer Flat Road (AKA Old Sheffield Road) about 10 miles east of Escalante and found a nice place to camp a mile or so south of the highway. The next morning we drove around searching for the best place to start hiking, and ran into 100 or so cows being run to a different spot. We parked at a small turnoff near the rim of the Phipps drainage and started hiking northeast. 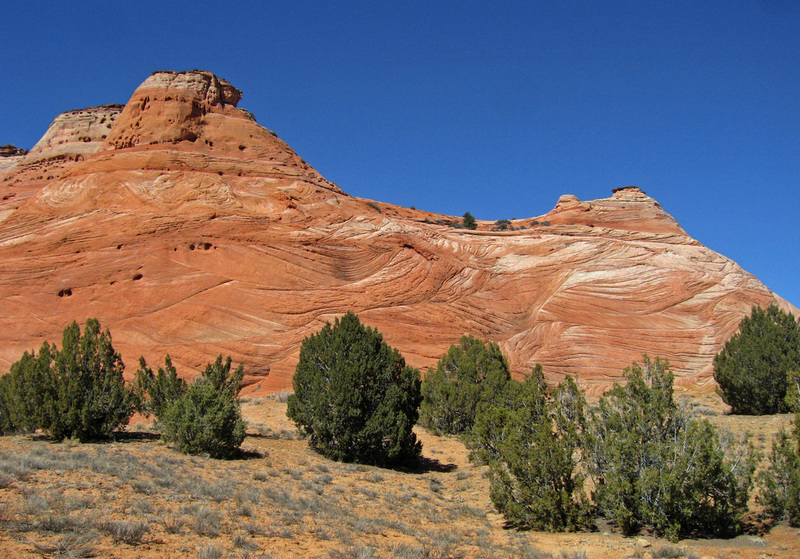 We reached the rim and scrambled down slickrock slopes for 350 feet or so until we reached the dry wash. We continued down the wide open wash for 2.5 miles, passing some incredible alcoves to our right on the south side of the canyon. Any standing water we saw was frozen solid and snow lingered in shady areas. The canyon turned north about halfway to the arch and got quite brushy. Large cottonwood trees lined both sides of the wash. We eventually reached the correct side canyon that takes you towards the arch. 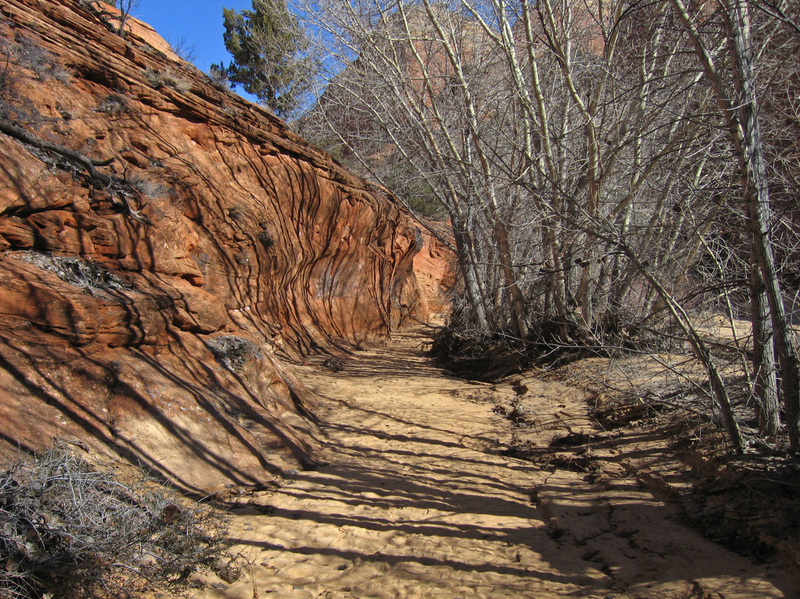 A cairned path guides you up the slickrock and small cliff bands to the open desert above the canyon about 300 feet up which did involve a little scrambling. 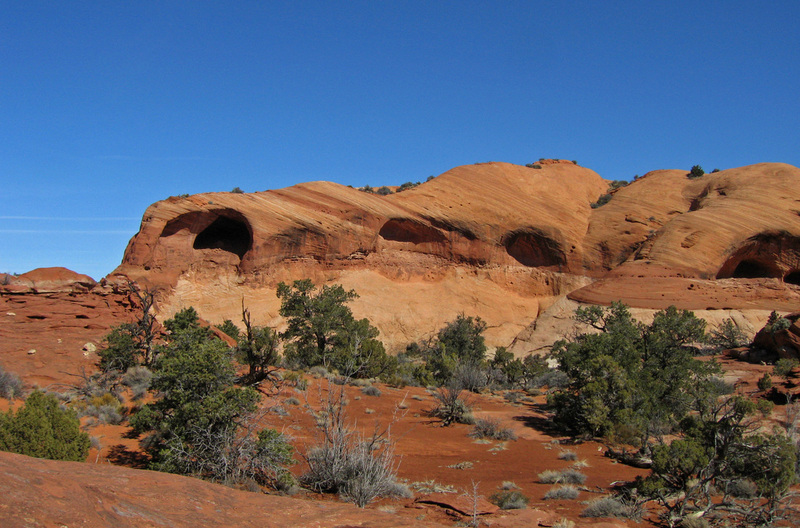 I wasn't completely sure but I think the arch and surrounding landscape is Wingate Sandstone. 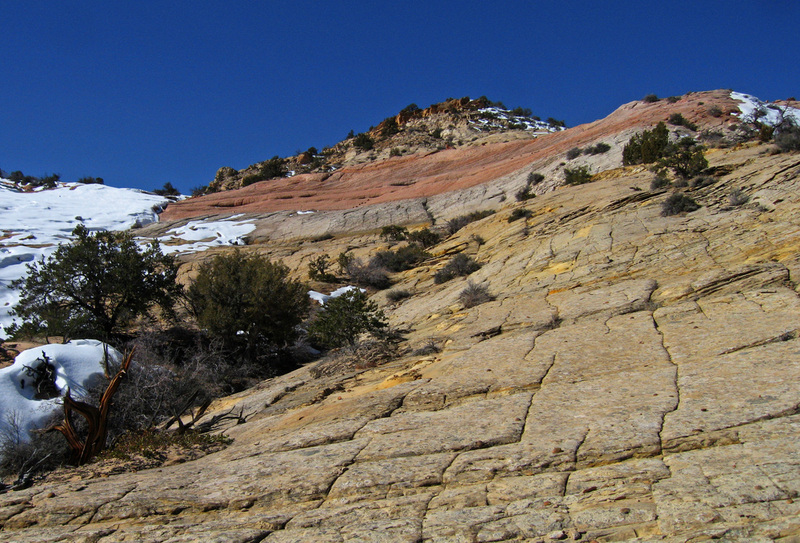 The slickrock at the upper end of the canyon where we had parked was definitely Navajo and hiking down canyon we cut down section. 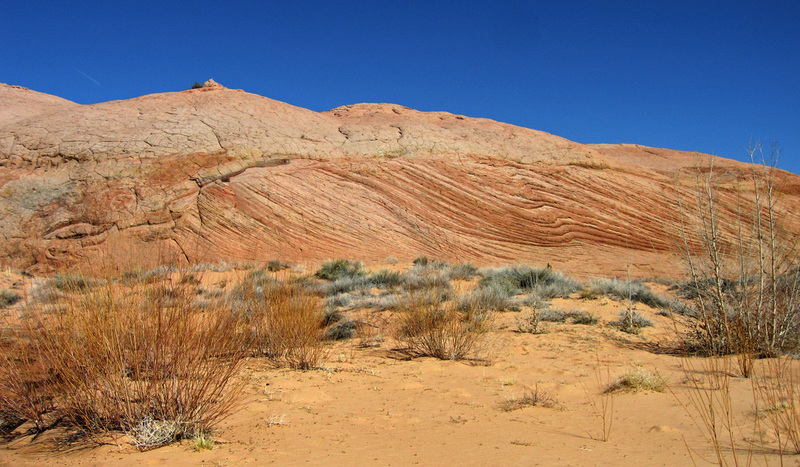 However the Kayenta wasn't really visible in this area which was why I was a little confused. Anyway, we reached the arch and I was shocked at its size! Walking right through it was a sight to see. See the banner photo above for a panoramic view of the arch. After a nice lunch break, and trying to climb to the top of the arch, we returned to the car and since the day was only half over we thought we could pay a visit to the "famous" Zebra Slot known for its colorful photos. We drove over to the Hole-in-the Rock Road and followed this dirt road down to the Halfway Hollow Trailhead, which is merely a small pullout about 4 miles past where the road crosses Harris Wash, where it turns more due south. We hiked a nice trail for a couple miles roughly following Halfway Hollow until we reached Harris Wash once again and crossed it. Here a sign marked a junction. Heading straight for a few more minutes up a deep sandy wash took us to the start of Zebra slot, which turned out to be both very short, and full of water. Plus the sun was well past noon so there wasn't any glow either so it was a disappointment. 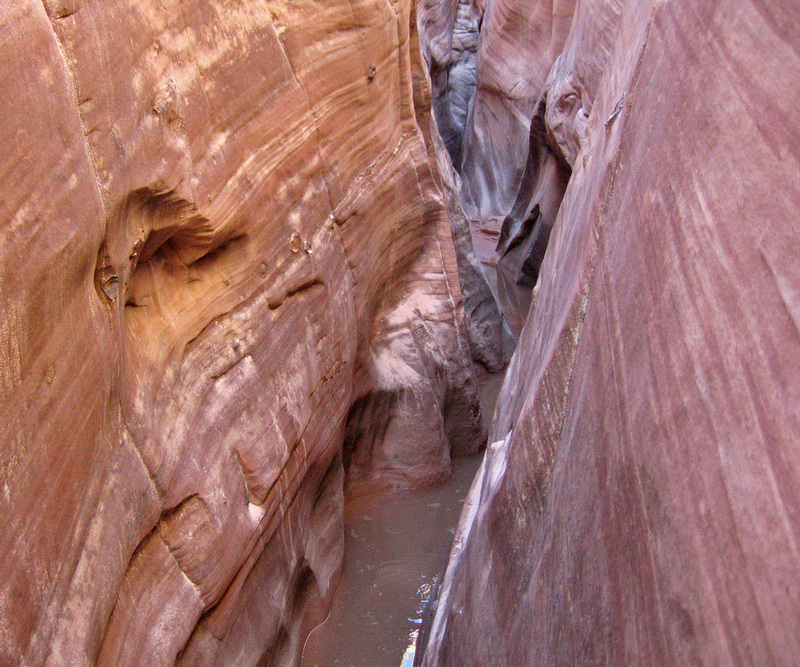 We also hiked down Harris Wash for 15 minutes to see Tunnel Slot (AKA The Birth Canal) but that was also filled with 33 degree water so we didn't hike into it. We just hiked back to the car and camped at the Harris Wash Trailhead so we wouldn't have to do any driving the next day where we planned to hike up Red Breaks.